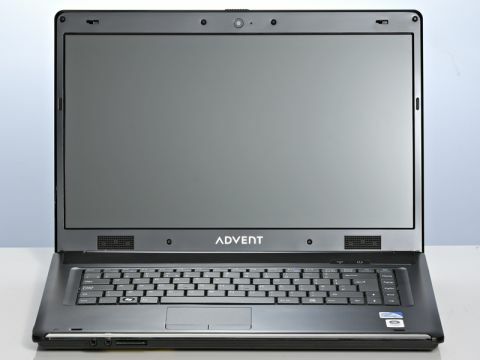 On first impressions, the Advent Roma - Advent's latest in its line-up of PC world-only laptops - looks to be a decent entry-level PC. On the outside, it appears Advent has done a fairly decent job - it won't exactly the set the world alight, but the lid's subtle print design looks quite funky and overall it's very neat and all the major functions, like the power button and wireless switch, are easy to access. The keyboard is excellent too, with a nice, cushioned feel to each of the keys as you press them – you can imagine typing for long hours on here without grumbling. At £379.99, it isn't that expensive either, but where the Advent Roma suddenly starts to look less appealing is when you find out what's underneath. 3GB of RAM is pretty reasonable at this level, although not particularly impressive either, but where the Roma really falls down is in the heart that powers this machine. The Intel Celeron processor is pretty basic in terms of performance - a dual-core processor, which often features in similarly priced laptops, does a much better job at handling lots of open programs at once. It also comes with on-board graphics, which can't display fancy 3D graphics as well as a dedicated type of graphics card. As a result, you'll only be able to play the most basic of computer games on the Roma, because anything slightly intensive results in a lot of stutter and jerkiness. The Roma comes with Windows Vista Home Premium pre-installed, so you get all the eye-candy that makes everything look great, and despite the on-board graphics, it handles it very well, and it's also fast at doing all sorts of other tried-and-tested jobs like loading web pages. A shame really because the Roma's 15.6 inch panel displays movies in the correct widescreen format, without huge borders above and below the main picture, and HD movie playback is very smooth. An HDMI port on the side of the Roma gives you the option to view movies on a large-screen LCD TV, which is a good thing as the Roma's panel could be a little brighter. At just over 1.5 hours, battery life on the Roma isn't exactly commendable. This certainly isn't the kind of laptop you'll be taking for long trips; it's clearly designed to spend much of its time at home, with a mains charger within easy reach. One of the Roma's greatest features is the fact that it comes with hardly any annoying software pre-installed. Clearly, the company selling this laptop – that is, PC World to be exact – know that most customers prefer to have a clean slate. Instead, the Roma comes with a handy tool that contains a range of great software that you can download, with a try-before-you-buy option first.